Mumonkan Aikido Club invites you to Aikido trainings in Minsk, Vitsebsk and Navapolatsk. We invite all those who are interested in applied aspect of martial arts. Your gender and level of physical fitness do not matter. The intake to Aikido groups is open constantly – just call us and come to us for free first lesson. Safety tips, throws and holds, acrobatics, striking techniques. Protection against simultaneous attack of several persons. Techniques of dealing with an armed opponent. 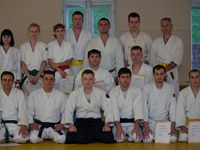 Mumonkan club is one of the leading Aikido schools in Minsk and Belarus. The club has two branches: in Vitsebsk and Navapolatsk, and it is a part of Belarusian Aikido Federation. Our trainings include not only classical techniques. We try to complement the Aikido art and adapt it to real life needs. We focus a lot of attention on studying throwing and striking techniques, as well as on fighting tactics. The Mumonkan Aikido Club has founded a Mumonkan Aiki-Jutsu self-defense section. However, the choice of training loads intensity is up to you. The training program is based on the principle "from simple to complex", intensive tasks are alternated with the easier ones. Our classes begin when the working day is over. So, you can devote a little time to your own precious self without being bothered with trifles. An Aikido training is a good way to take mind off things. Trainings for children (10+ years old) and teenagers are held in the evenings in martial arts hall of the Sports Complex "Uručča". Children will learn techniques of self-defense. You are welcome to come as a family! Besides studying Aikido techniques, principles of using weapon are studied. 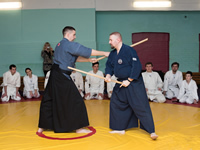 Mumonkan is one of those few Minsk Aikido clubs, where Katori Shinto-ryu techniques is practiced. 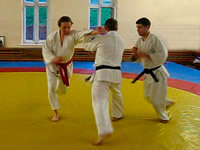 You can take your Aikido classes in the gym where you can get most conveniently to. In Minsk, one dojo is in the center of the city (a 5 minutes' walk from "Frunzienskaja" underground station), another one is in "Uručča" Sports Complex. In Vitsebsk and Navapolatsk, the dojos are in the center of these cities. Our aikido school provides training to people of all ages: children, teens, men and women. You will feel comfortable anyway. For more information about our vision of martial arts and the training process, please see "Our vision of Aikido and unexpected attack" page. About the Mumonkan Aikido Club. News of the Mumonkan Aikido Club. We announce intake for Aikido groups. You are welcome!